As a matter of fact, sensors and detectors are an important part of any system for remote monitoring and control. The sensors and detectors provide transformation of environmental parameters into electrical signals. 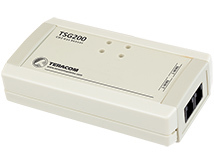 These signals are monitored from devices either for Ethernet remote monitoring or GSM remote monitoring. 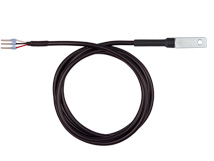 1-Wire temperature sensor with -40 to +85°C working range and IP65 protection. 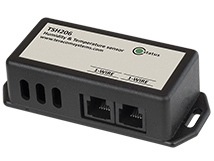 Digital temperature sensor with a 1-Wire interface and -40 to +85°C working range, IP20 protection. 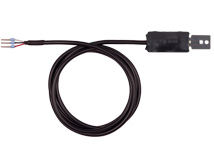 1-Wire humidity and temperature sensor with IP00 protection. 1-Wire humidity and temperature sensor with IP20 protection. 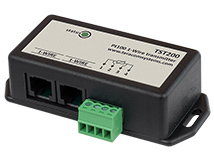 1-Wire Pt100 transmitter for accurate wide-temperature monitoring. 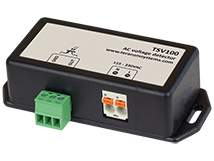 1-Wire current sensor with galvanic isolation and IP30 protection. 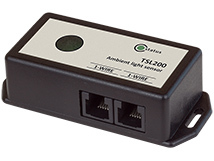 1-Wire voltage sensor with galvanic isolation and IP30 protection. 1-Wire 0-20/4-20mA current loop transmitter with galvanic isolation. 1-Wire carbon dioxide sensor with IP30 protection. 1-Wire barometric pressure sensor with IP30 protection. 1-Wire ambient light sensor with a high resolution. 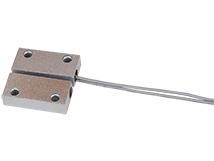 Precision temperature sensor with -20 to +60°C working range. 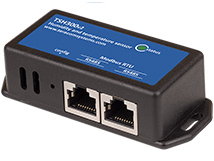 RS-485 humidity and temperature sensor with IP20 protection. AC voltage detector with galvanic isolation and IP30 protection. 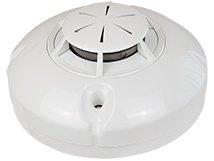 Smoke detector with dry contact relay output and IP30 protection. Magnetic door sensor with IP65 protection. As shown above, the sensors convert the environmental parameters and communicate with controllers for the remote monitoring through a digital interface. The interface can be either 1-Wire or RS-485. In fact, the 1-Wire interface is patented by Maxim integrated company. Because of its addressability, a few sensors can work in parallel on the same bus. In this case, several parameters can be monitored by a single controller. 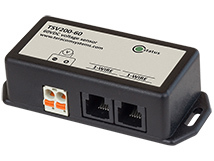 While the 1-Wire interface is designed to operate over short distances it is very popular for home and office automation. On the other hand, with a specific design, it can be used for industrial systems also. RS-485, also known as EIA-485, is jointly published by the Telecommunications Industry Association and Electronic Industries Alliance (TIA/EIA). As well as the 1-Wire interface, RS-485 enables parallel connection of several sensors on the same bus. Granted on the design, the sensors with the RS-485 interface are suitable for noisy industrial environmental. In addition, relatively long distances are supported. Provided that both digital interfaces have specific requirements for the construction of the system sensors-controller, we recommend carefully reading the documentation for sensors for long-term and trouble-free operation. Together with excellent reliability, all our sensors support the procedure for updating over the working interface. Despite the sensors, detectors show the status of monitored parameter in two discrete values – on or off. All our detectors have either relay or open collector as outputs. In this case, they fit digital inputs of controllers in “dry contact” mode. The detectors are either powerless or self-powered from the monitored side.